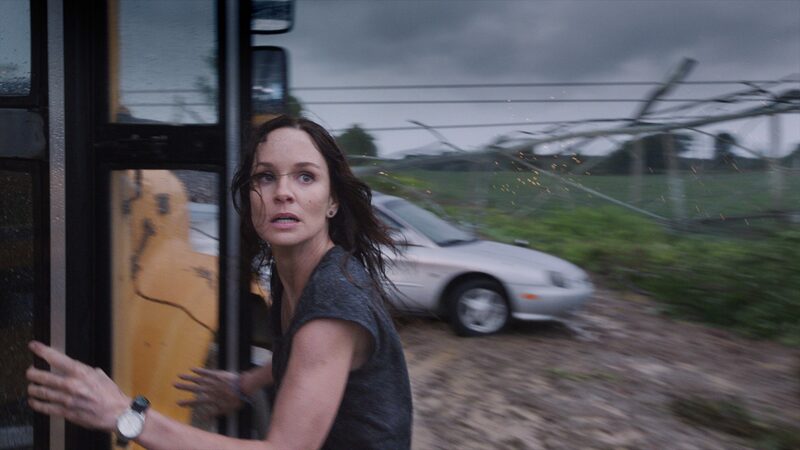 As part of the launch for the new movie INTO THE STORM, we’ve have this awesome Q&A with Sarah Wayne Callies (The Walking Dead, Prison Break), who plays Allison Stone in the film. Starring Richard Armitage (Spooks & The Hobbit) Sarah Wayne Callies (The Walking Dead, Prison Break), Matt Walsh (Veep), Nathan Kress (iCarly), and Jeremy Sumpter (Friday Night Lights). QUESTION: What was the draw for you to be a part of Into the Storm? SARAH WAYNE CALLIES: I thought it’d be fun to do a big, crazy special effects movie. I’ve never done anything like that before. And then I read it and what really held my attention was the fact that it’s this huge spectacle of a movie, but, at the same time, it’s also a story about how people who are strangers can become almost family in the course of a single day when that day threatens all their lives and is chaotic and overwhelming. I just think there’s something really moving about that. It’s the story of strangers who become family in the course of 24 hours. Storytelling is an old thing that humans have done for as long as we’ve been around. We tell each other stories to try and figure out who we are. This is a summer movie but it’s still a movie that tells us something about who we are and who we might be. QUESTION: You play Allison Stone, who a climatologist and meteorologist and has joined the storm-chasing team for the first time. What can you tell us about her? SARAH WAYNE CALLIES: Allison is somebody who’s studied weather events in depth and with a great deal of passion and who has incredibly strong opinions about the need for certain kinds of climate work, to demonstrate certain things about climate change. In a way, she’s sort of a combination between an academic and ideologue, and all of a sudden these storms leap out of her textbook and into her face. So, it’s the story of a woman who’s had a lot of ideas and a lot of theories about weather and about the politics of weather who all of a sudden finds herself very much immersed in the practicalities of weather, which are two very different things. She’s getting her hands dirty for the first time and it’s very, very dirty. QUESTION: I understand you did quite a bit of research for the role? SARAH WAYNE CALLIES: I did. I mean, I’m the daughter of academics. Research is just part of my de facto approach to things. So I got a meteorology textbook and thought I would just read it and try and make sense of it. But about fifteen pages in, I discovered that I quite simply did not have the physics to wrap my head around what was going on. So I reached out to a professor of meteorology at the University of Michigan, which is in Ann Arbor, very close to where we shot in Detroit. I just ‘cold called’ him. He was the emeritus professor or chair of the department, and turned out to be a gentleman, I believe, in his 80’s. So, when I called, I sounded like a little like valley girl, ‘Hello, I’m an actor and I have some questions about weather. It’s a new movie.’ And, bless his heart, we actually met for lunch while I was filming and he was so patient, answered all kinds of questions for me and drew me all kinds of pictures that helped break down the science for somebody who has never been particularly strong in that suit. He was a doll. And then, of course, I would take it to Steve. I’d say, ‘Steve, okay, you know how they say vorticity and none of us knows what that means?’ And we’d draw pictures and get all excited. Steve’s a big geek like I am, and we thought it was super cool to be able to be really specific about what all this stuff means and to be able to throw that language around in a way that Allison could. QUESTION: Was he a fan of The Walking Dead? QUESTION: Can you talk about working with Richard Armitage, who plays Gary, the high school vice principal, and the bond that forms between them? So, when I found it was Richard, I immediately wrote to Andy Lincoln [Callies’ former co-star in The Walking Dead] because my assumption is that all British actors know each other. And so far, I haven’t been wrong. [Laughs] Richard and Andy had done Strike Back together, and Andy was thrilled. I’m on this funny streak. I had, I think, five consecutive English leading men. So, when I called Andy about Richard, he said, ‘Oh, you’re going to love him. He’s a wonderful guy. He’s super smart. He’s really kind and he makes the set a great place to be.’ And then, unbeknownst to me, Richard did the same thing and called him. [Laughs] So, we actually came together having had a good friend vouch for each other, which was helpful. Then, maybe a week later, Richard and I both were at San Diego Comic-Con. He was there with The Hobbit movie gang and I was with The Walking Dead gang and they were coming in right after us at a press event. But we were going to have to leave before they arrived. So I literally scribbled a note on a piece of paper and just said, ‘I heard from Steve that you’re going to be playing Gary. Can’t wait to meet you.’ And left a little lipstick mark on a piece of paper and handed it to a journalist. I said, ‘Would you please give this to Richard Armitage?’ She’s like, ‘Are you kidding me?’ I said, ‘No, I’m not.’ [Laughs] So, we were passing notes back and forth before we met. And I really like what he did with Gary. The point of Gary, the point of all of these people, is that they’re not heroes. For all of the amazing, gorgeous films that are coming out right now with superheroes, this is just a movie about two people who are both teachers—I’m a professor and he’s an assistant principal—and we’re both parents and end up in a situation where we’re the ones who’ve got to advocate for and try to save as many students as we can, and also try and find our way back to our own children. And that’s a pretty simple story. And Richard is so good looking. He’s so strong and he’s got such an incredible presence that it would’ve been easy for him I think to play Gary like a sort of Cary Grant-style hero. That wouldn’t have been the story but it would’ve been easy for him to do and everybody would’ve loved him for it. But he didn’t do that. He just put his ego aside and decided to play him as a regular guy and a man who was broken by the loss of his wife and having a hard time reaching his children. And I really admire what he did with that role because I think he did it beautifully. QUESTION: Can you also talk about working with Matt Walsh, who plays Pete, the leader of the storm-chasing team? SARAH WAYNE CALLIES: Yeah, Matty was fantastic. I think we got really lucky with Matt because he doesn’t work from a place of ego. Matt works from a place of wanting to tell the story, and I thought he gave Pete a real beating heart. He was somebody who genuinely believed in a project and had put his whole heart and soul into it, just as Allison had, but we have completely different reasons for what we’re doing. Pete is somebody who wants to show people something they’ve never seen before, and it’s also the only way he’s going to pay his bills. But he is a true believer and what’s kind of cool is that he and Allison are both passionate and intense and have differences, but they’re the differences that people have who deeply believe in what they’re doing. He’s not a mercenary which I think is pretty cool. And having Matt Walsh on a set is just a little fun. He’s somebody who can look at you from across the field and make you crack up and you don’t even really know why. Matt just made everybody laugh and he was an absolute doll. We got really lucky; we had a really, really nice cast of people. QUESTION: What was it like working with director Steven Quale, and how did he communicate his vision to you while bringing out so much naturalism in the characters? SARAH WAYNE CALLIES: Working with Steve is like entering the laboratory of a mad scientist. I mean, no matter who you are, he’s smarter than you, but he doesn’t make a point of it. [Laughs] It’s a little bit like sitting down and playing chess with Bobby Fischer. You’re hanging out with somebody who sees so many moves ahead of you that the best thing you can do is go along for the ride and do your work. So, there were times where he was sort of bouncing around from bubbling beaker to bubbling beaker because it’s an incredibly technical movie. And I think Steve did a wonderful job of not making us feel like this is a movie about a tornado and you’re a bunch of meat puppets. The truth of the matter is that the tornado is the star of the movie, but I think we’re also going to give people something very moving and very human. There are going to be a lot of people who buy the ticket because they want to see a big tornado and they’re going to get their money’s worth. It’s a big tornado, and it’s amazing. But Steve did a great job of not making our work as actors secondary to any of that. The very first conversation he and I had was about, ‘How do we make this the most grounded human story that we possibly can?’ I found him really collaborative to work with. He’d listen to what you had to say and go, ‘Ok, let’s craft this thing together.’ There would be moments where I’d be worried about how something would work, and he would explain technically how he was going to deal with it. And, I’ll be honest, I never really understood the explanation. But I thought, ‘Well, he’s got an explanation so I’ll just trust him.’ And at the end of the day that trust I think paid off. QUESTION: What was it like for you to work on such a stunt-heavy film? Did you do those stunts for real? SARAH WAYNE CALLIES: Oh, yeah. That was a part of the draw of the film for me, because I get to fly around and do wire work and stuff like that. I’d never had much of an experience doing it before on sets. I studied aerial arts for three years when I was in grad school and loved it. And I’ve always wanted to do a job where I could bring some of that work in. So, we got to that scene outside the bank on the tank and our stunt coordinator, he’s a high flyer. He’s the guy who made his living jumping off of sixty-story buildings without any kind of a harness and sort of aiming for a mattress. He was just incredible. He’s fearless and has a real sense of what’s possible. So, I got to do virtually all of it and it was amazing. Part of the thing that’s great about that kind of work is there’s just no acting involved. Somebody puts you on a wire and yanks you backwards, there’s a hundred-mile-an-hour fan and a rain tower in your face, you don’t have to act scared. [Laughs] You’re right there. You’re scared. It’s pure adrenaline. And it was fun. It was really, really fun. The stunt coordinator and I talked about it afterwards. I was like, ‘Dude, let’s do a movie like Crouching Tiger, Hidden Dragon where we just fly through the whole thing.’ [Laughs] I absolutely loved it. QUESTION: How about the special effects? I understand that the rain and the wind machines were there for about half the shoot? What was great, and I know that this was intentional on Steve’s part, was they had as many practical effects as they could. So, we had hundred-mile-an-hour fans, which you can’t really fathom. The first time they turned it on in front of me in a scene it blew me 20 feet off my mark. You could literally lean your full body weight into it and it would hold you up. And then they’d throw dirt and leaves into it so there’d be debris flying around. Then they turned the rain towers on and it certainly wasn’t comfortable, but, again, it saved us the indignity of trying to act like you’re in a tornado. You’re just there. I think green screen movies can be difficult because if you’ve got seven actors who are all imagining something different, it can start to become a little incoherent. We had a huge number of practical effects, and because Steve does come from such a technical background, he was able to unify our visions whenever we had to do imaginative work. He’d sit us down before we would start filming and show us all the mockups of the effects so that we would know what we’d be seeing. QUESTION: In this film, cameras are positioned everywhere, and there is a lot of handheld camerawork. What was that like for you as an actor, and did having so many cameras around affect your performance? SARAH WAYNE CALLIES: In a way, what was great about it was that Richard and I both come from theater. I left this movie and went right into a play and Richard’s doing a play right now. There’s something great about being on stage, which is that it keeps you very honest because whether or not you’re talking, people are looking at you. If you’re not acting all the way down to your feet, people are going to see that your body is lying and they’re not going to buy it. So, in a way, doing this movie was like doing a play because we had GoPro Cameras and an actor would have a camera over their shoulder and half the time it would be a tactical camera, so you never knew when you were being filmed. I don’t know how our cinematographer lit the film because it’s a virtually impossible task but, thankfully, it’s not a movie in which any of us had to look particularly good. [Laughs] We just had to look like people. But the effect of having so many cameras around kept you very honest as an actor because you can’t say, ‘Well, I’m going to sit out this take.’ Everybody is on all the time, which I think is a wonderful way to work. And because it’s somewhat of a ‘found footage’ movie, you can’t do a traditional master, tighter close-up kind of shot because those angles might not exist in the ‘real’ world of the storytelling. So, a lot of times a scene will play as a single wide shot where you see five characters. There’s a scene where we go to get the two kids who’ve been trapped—you’ll have to see the movie to know if we succeed—but you see the reactions of the three of us. And instead of cutting to the kids and cutting to the dad and cutting to the kids and cutting to me, it plays almost the way it would on stage. It’s very real and very raw. And I think the rawness of the way the footage is captured also helps reflect the rawness of the emotions that are involved. It’s not so much ‘shaky cam’ that you need to take a Dramamine before you go into the theater. But the camera itself is a character because the camera’s being held by the characters. And I’ve got to give a shout-out to the camera team because, God bless them, they were with us in all of the wind, all of the rain, wrapped in plastic, fighting with the Alexa [camera] to make her do their bidding. It was no fun for them and they really did beautiful, beautiful work. QUESTION: Looking back at the experience, do you have an experience that was particularly memorable for you? He had on a cheap wool suit because his character would wear a cheap wool suit, and he insisted on that to the costume designer, ‘Get me something this character could afford.’ So, he had a cheap, wool suit and when it got wet, he smelled like a wet sheep. And they can hear this conversation over the earphones. And the makeup artist, who’s a marvelous woman who somehow kept makeup on our faces with a hundred-mile-an-hour fan right on us, came in and handed me a tube of Chap Stick that was bacon-flavored and said, ‘Put this on,’ and closed the door. So, I put on the bacon-flavored Chap Stick. They closed the door and I was sitting there with my pig-smelling lips. Richard was here with his sheep-smelling suit and I turned to him and said, ‘Richard, you have no idea how many women would be thrilled for the opportunity to be locked in a very small space with you. And the only thing I can think is that you smell like a barn.’ We both started laughing. And for the rest of the day, every time they cut, he would just turn to me and go, ‘Baaah!’ It was just a lovely moment of two people surviving being wet and freezing cold. QUESTION: What do you hope audiences will come away with after having experienced this movie? SARAH WAYNE CALLIES: I think maybe it’s possible that this is a movie about the fact that a parent’s love for their children is stronger than even the most violent storm imaginable. I think that’s pretty cool. And hopefully people will come out of this movie with a stronger sense of what we’re capable of as regular old people who try and protect each other, which can be pretty amazing. But, look, if they just want to go see some really cool special effects and ignore those of us with arms and legs running around, that’s okay too. If you just want to sit in the dark for a couple of hours and let us tell you a pretty cool story about a really rough day, I’m okay with that too. I don’t think it’s for me to tell people what they might get out of it. I just know I saw it and I knew it was coming and I had a really, really, really great time. ← The Hobbit: The Battle of the Five Armies – teaser trailer and poster are here!